Alvin Ailey American Dance Theater, one of the world’s most popular dance companies, will return to the UK for the first time in six years and heads to the Royal Concert Hall, Nottingham on 30 September & 1 October during its autumn UK tour 2016. 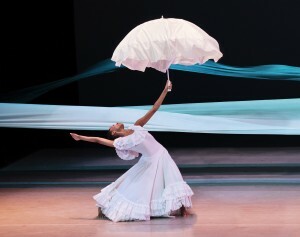 Founded in 1958, the company is recognised by the U.S. Congress as a vital American “Cultural Ambassador to the World.” Under the leadership of Artistic Director Robert Battle, Ailey’s performances celebrate the human spirit through the African-American cultural experience and the American modern dance tradition. In almost six decades, Ailey’s artists have performed for over 25 million people in 71 countries on six continents and continue to wow audiences and critics around the world. The Royal Concert Hall programme will include UK premieres by two of today’s most acclaimed choreographers: the uplifting Exodus by hip hop choreographer Rennie Harris; and the spiritual journey of Four Corners by Ronald K. Brown. Also in the exhilarating line-up is the company UK premiere of After the Rain Pas de Deux – the dreamlike duet by Christopher Wheeldon. Drawing the evening to a close will be Revelations by Alvin Ailey. The beloved crowd-pleaser, the most widely-seen modern dance work in the world, will be performed by the incomparable Ailey dancers. Revelations premiered in 1960 and continues to bring audiences all around the world to their feet. Exodus (2015) Choreography by Rennie Harris / Music: Original compositions by Raphael Xavier, “A New Deal” by Ost & Kjex. Acclaimed hip-hop choreographer Rennie (Lorenzo) Harris created a work that explores the idea of “exodus” – from one’s ignorance and conformity – as a necessary step toward enlightenment. Set to gospel and house music along with spoken word, the work underscores the crucial role of action and movement in effecting change. Exemplifying his view of hip hop as a “celebration of life”, Exodus marks Harris’ latest invitation to return to spiritual basics and affirm who we are. His previous contributions to the Ailey repertory include Home (2011) and Love Stories (2004), Judith Jamison’s dynamic collaboration with Harris and Robert Battle. Four Corners (2013) Choreographer: Ronald K. Brown / Music: Carl Hancock Rux, Yacoub & Various Artists. Four Corners brings to life the vision of four angels standing on the four corners of the earth holding the four winds. Drawing inspiration from the lyrics of Rux’s Lamentations, Four Corners trails 11 dancers as they rise to seek a life of peace on the “mountaintop”; a powerful and hope-filled journey of tribulation, devotion and triumph. After the Rain Pas de Deux (2005 / Ailey Company Premiere 2014) Choreography by Christopher Wheeldon / Music: Arvo Pärt. An instant hit at New York City Ballet in 2005, Christopher Wheeldon’s dreamlike duet – praised for its sublime simplicity and intricate partnering – is revealed in a fresh light as the Ailey dancers make it their own. Set to music by the Estonian composer Arvo Pärt, the sensual male‐female pas de deux has resonated deeply with audiences and marked the first work by Christopher Wheeldon to enter the Ailey repertory. Revelations (1960) Choreography by Alvin Ailey / Music: Traditional Spirituals. More than just a popular dance work, Revelations has become a cultural treasure, beloved by generations of fans. An American classic acclaimed as a must-see for all, Alvin Ailey’s signature masterpiece is a tribute to his heritage and genius. Using African-American spirituals, the work fervently explores the places of deepest grief and holiest joy in the soul. Seeing Revelations for the first time or the hundredth can be a transcendent experience, with audiences cheering, singing along and dancing in their seats from the opening notes of the plaintive I Been ’Buked to the rousing Wade in the Water and the triumphant finale, Rocka My Soul in the Bosom of Abraham.